The Withings Pulse HR is a bit of a fitness tracker throwback for the company, which is back after a brief and underwhelming spell under Nokia's ownership. Stirring up memories of its Pulse Ox tracker, which came before Withings started rolling out fitness tracking features discreetly hidden inside beautiful watches, the Pulse HR packs in a lot of what we found in its Steel HR Sport hybrid smartwatch that launched in 2018. That includes heart rate monitoring, tracking modes for 30 different activities, and pretty big battery life for a fitness tracker. With up to 20 days on offer, it'll outlast arguably its closest rival the Fitbit Charge 3 by a fair distance. It'll also serve up notifications from your phone and has Connected GPS, which means you can piggyback off your phone's GPS signal to map outdoor activities. Priced at $129.99, it's clearly competing with the likes of the Charge 3 and Garmin's Vivosmart 4. So does the Withings fitness tracker offer a better fitness tracking experience than Fitbit and Garmin's trackers? We've been putting it to the test to find out. Here's our full verdict on the Withings Pulse HR. Design-wise the Withings Pulse HR, as already mentioned, looks very similar to the Pulse Ox, which launched way back in 2014. It’s a slim all-black band with a silicone rubber strap and that's really about it. Its curved front is made of plastic and the usually-hidden underside is made from 316L stainless steel. In the sea of black the large, bright buckle stands out, but otherwise some of Withing’s wearable design experience is very much in evidence here. First, there’s a solid degree of stretch to the strap. Comfort and a fairly tight fit to aid the heart rate sensor are not mutually exclusive. The look is also moodier and starker than that of the Huawei Band 3 Pro or the Fitbit Charge 3. You are not, theoretically at least, tied to the sombre style if all that black seems boring. Little quick-release bars let you replace the strap, with grey and red versions among the alternative band colours up for grabs. Judging by our use, it’s the main unit you need to worry about in terms of longevity anyway. The polycarbonate top finish looks great. It gives the screen a matte appearance and diffuses, ever so slightly, the light from the display. However, even light scratches can damage this textured layer, casting shiny streaks across the Pulse HR’s front. Most alternatives, even cheaper ones like the Huawei Band 3 Pro, use toughened glass to avoid scratches. One bad day is enough to leave the Withings Pulse HR looking tatty. Clumsy folk beware. And, yes, we have managed to damage our Withings Pulse HR a little after a couple of weeks. The risk is exacerbated by how easy it is to wear this tracker all day, all night, all week. It’s comfortable, the battery easily lasts a week. It has 5ATM water resistance so you can keep it on in the shower and swimming pool with automatic swim tracking supported. But there’s no rubber buffer or tough layer to keep it looking pristine. In a few respects Withings seems behind the pack. The screen here is a good example of that. The white OLED display used here looks smart enough, fading almost imperceptibly into the black surround. But it’s actually far smaller than the screen of the old Pulse Ox, and is pixel poor considering the price. The most important knock-on effect is how little information the Withings Pulse HR fits on any one screen. Aside from the clock face, which shows the date and time, you’re limited to one stat per page. This does not matter so much as you walk around, perhaps occasionally checking your step count. But it's not ideal during exercise. We’re now used to trackers that let you see multiple stats per screen, so you don’t need to fiddle about just to see your distance and heart rate mid-run. It’s compounded by the way you wake the Withings Pulse HR. You either press the button on the side, or flick the watch around to your face. That first method is, predictably, foolproof. But the second is not. Too often you’ll flick your wrist and nothing will happen. It's while running, rather than walking, that this tends to be a problem. This suggests the algorithm that tells between your average arm swing during a run and one as you try to see if your heart really is pounding as hard as it feels is not clever enough. Withings’s mode of interaction is dated too. The Pulse HR does not have a touchscreen. You use either the side button or a tap on the casing (which relies on the accelerometer) to flick between interface pages. There is a casual simplicity to this style, and the Withings app lets you choose what screens to pack in, but they only cycle one way. But it can seem frustratingly leaden, particularly if you use the button – screens flick by much more quickly with case taps. It also makes the Pulse HR seem an entry-level fitness tracker, which is at odds with its price. 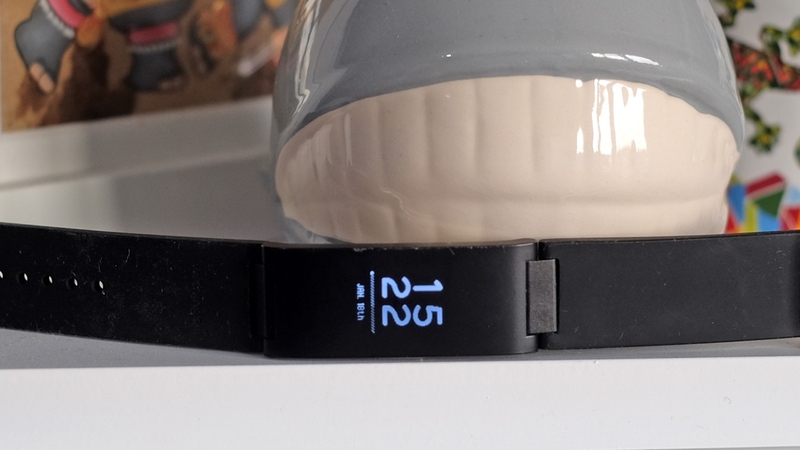 On the fitness tracking front, you can expect all the usual suspects here: the Pulse HR will count your steps, track distance covered, and offer calorie burn estimates. Surprisingly though, there's no altimeter to track elevation (stairs climbed). If you're planning to go swimming with it, you're getting session duration and calories. So no advanced swim metrics like you can get on the Charge 3 or other dedicated swim-tracking wearables. There's also sleep monitoring too (more on that later), but thankfully there's no real alarm on the accuracy front. In comparison to the other devices we pit it against, step counts over the space of a day ended up similar. The Pulse HR will track your sleep too, but there’s nothing too interesting to see in what it records. You end up with blocks showing periods of light and deep sleep, and any recorded wake-up moments. There’s no assessment of your breathing, or any separation of REM and “deep” sleep. However, Health Mate does spit out a sleep score, marked out of one hundred and gives you a green, amber or red rating for a few core elements like duration and sleep depth. Wear the Pulse HR consistently overnight and Health Mate also adds a “regularity” score. It's a solid sleep monitoring experience if a little basic. The Pulse HR as mentioned includes Connected GPS, letting you borrow the GPS signal from your phone as you run. It can display the same stats and record the same kind of mapped routes you’d see from a fully featured runner’s watch. A long press of the side button brings up the Withings Pulse HR’s activity menu. By default there are just a few favourites in here: running, walking, swimming, cycling and “other”, which would work as a heart rate-tracking gym mode. Dig into the Withings Health mate app and you can add many others, storing up to five on the way, from boxing to windsurfing. However, these additional modes are only really useful for better category logging in the app. They just record your heart rate and an estimated calorie consumption. Even the “weights” mode is like this. No extra reps data is involved. However, the Pulse HR is still a perfectly good choice if you want to record regular runs, particularly when a lot of people still run with a phone. We saw no issues with the GPS connection between the band and our Motorola Moto One smartphone it was paired with. And while the quality of recorded location data relies on your phone’s own GPS signal and chip, our tracked runs were comparable with a Garmin running watch. Heart rate readings are just acceptable, though far from best in class. The Health Mate app shows you a graph of your heart rate with only a single data point per minute. And even though these figures are likely the aggregate of multiple readings, we still found some unexpected dips during workouts, and even some missed minutes where the Pulse HR fails to record a reading at all. In these spots Health Mate just slots in a loose curve, a guess based on surrounding data. During one run, we took the Pulse HR out with both the Huawei Watch GT and Garmin Fenix 5 Plus and its heart rate sensor failed completely. It didn’t record a single reading over a 5K run. Granted, this is likely because it was shifted a little too close to the bony part of the wrist. But it’s still very bad performance for a tracker in 2019. We thought we had left truly unreliable wrist-worn HR sensors in the past. Of the handful of 5k and 10km runs tracked, the Pulse HR left “unrecorded" gaps in the final heart rate graph. Both the data and the way Withings presents it ensure the Pulse HR’s heart rate sensor is not truly useful as a training tool. Even resting heart rate readings are often way off the mark. You can manually scan for your heart rate using one of the home screen pages, but a few times it has pegged the rate at 120 or even 155 bpm when the reality was between 55-65. And as the Pulse HR’s screen time out is so rapid, the sensor doesn’t have time to show “corrected” readings – some heart rate sensors can initially seem confused before quite rapidly getting to a more realistic reading. Recording of your resting heart rate is scant too. In Health Mate you end up with a graph with a data point at each hour. This results in a completely useless wobbly graph line that bears almost no relation to reality. Real 24/7 resting heart rate analysis is far too common for this sort of style to seem acceptable. We used the Huawei Watch GT before the Pulse HR. Its every-two-minutes readings and guesswork-free graphs are an order of magnitude more useful. The Withings Pulse HR makes most sense when considered as a basic fitness tracker that is also a vehicle for Connected GPS. It’s a genuinely good way to analyse your pace and distance when running or cycling, if not quite as effective at recording your exertion level. The data fidelity just isn’t there. Now that both software and hardware are back in Withings' hands, Nokia Health Mate is Withings Health Mate once again. If you want a good breakdown of how it all works, definitely check out our comprehensive Withings Health Mate guide. Not a lot has changed since the Withings name returned. It's still a very clean, streamlined experience that lets you see your data at a glance and dig a bit deeper if you feel the need to. Along with checking on data there are some fun elements to discover in Health Mate too. The Leaderboard is the most accessible. You invite friends, and then compete to see who takes the most steps over a week. Sleep Smarter is one of a handful of programs that offers tips based on your sleep and how tired you feel. There are also pregnancy and body fat composition programs, but these really need one of Withings’s smart scales. What you don’t get are some motivational tools that help keep you going without a gang of Withings-owning friends. For example, Garmin Connect offers steps challenges that pit you against other people on the platform, and Fitbit has “Adventures”, which virtually map your steps along real-world trail routes, unlocking sights and bits of trivia as you go. That said, the Health Mate is a pleasant place to be. There’s far less potential for intimidation than in Garmin Connect. People looking to up their general activity, or trying a couch-to-5K programme should get on with it just fine. In terms of extras, there are just two that accessible from the band. That's alarms and notifications. Both are simple. You can set one alarm, making it a one-off or recurring, and it sets off the Pulse HR’s vibration motor for around 10 seconds. It might be enough to wake you up, it might not – but it did the job for us. Notifications can be snagged from any app(s) you like too, including messaging services like WhatsApp. These are text-only alerts that run ticker tape-like across the display. While the characters are tiny, the clarity of the OLED screen makes them fairly easy to read. However, you can’t access these notifications after they first appear. And you only get excerpts and, of course, you can’t reply to anything using the Pulse HR. The band’s notifications are good enough to act as a way to judge whether you need to pick up your phone or not. But that’s it. This seems the right approach for a tracker with a screen only half the size of a postage stamp. However, being able to check the last notification or two in one of the home screen zones, not possible here, would be useful. Long battery life is the Pulse HR’s best feature. Withings says you’ll get up to 20 days’ use between charges. And as there’s quite a tight rein on battery-sapping features, the reality is not too far from this. It lasts around two weeks for us, including tracking of 45 minutes of exercise a few times a week. It’s lower than the claimed target because we use the “always on” heart rate mode. As standard, the Pulse HR only records during exercise. And given the resting heart rate data you get, switching all-day recording off does not seem like the worst idea. Full exercise tracking does not decimate its longevity because the screen does not stay on as you run or cycle (the screen’s cut out time is far too keen, if anything) and the band does not have to harvest its own GPS location data. Notifications are the other big variable in the stamina you’ll actually get. Keep these to a minimum and don’t manually check your heart rate every five minutes and you could well get to around the claimed 20 days. For all the criticisms we have, this kind of longevity is a delight. The Withings Pulse HR feels like a fitness tracker that hasn't kept up with the developments in this space. On paper, it suggests otherwise, with features like 5ATM water resistance and automatic activity tracking. However, Its navigation style feels clunky for a device that costs $129, the heart rate sensor is surprisingly spotty and there’s no altimeter. It is still a good fit if you care most about your daily step count and the distance and pace of your runs. But when the likes of the Vivosmart 4 and Fitbit Charge 3 can offer a better overall experience, we think there's better options for the money out there.